One of my favorite all time authors is J.R.R. Tolkien. He wrote a book a very long time ago titled “The Silmirilirian”. In that book there is a boat name “Palarran” the word means Far Wanderer. Seemed like a fitting name for our boat as we plan to wander pretty far. Excellent site, & always read your advice on HC.org. Many thanks for the photos of your starboard dodger. I have a Tayana 37 which needs a new dodger and was given some huge quotes. I will follow your lead. Hi Tawnya and CB! Greetings from Michigan. Love reading about your adventures. Have shared with Jim Karzcewski and Carol Roberts. They are currently in Egypt and will do the Med next couple of years. Keokuk is in storage at Irish in Charlevoix for the winter. We will be sailing most of the summer. Still love Lake Michigan and the North Channel of Lake Huron. 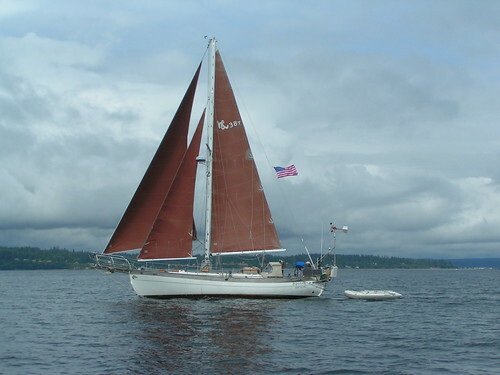 We are hoping to get a trawler (in addition to[Jim’s idea] or instead of [my idea]the sailboat) and do the Loop in the not too distant future. Love to you both. Live the life you were meant to live! As an engine room and stern man, I must digress and say, Nice Bow! Love the line!